We’re so inspired by the abundance of California and the diversity of plants and resources that are found here. We’re proud of our home state and wanted to celebrate some of our other favorite businesses offering special products that highlight and showcase the unique flavor of California. We’ve focused on products that are made with California iconic fruits and vegetables, native plants, seafood and shellfish, and (of course) local seaweed! Here’s our guide to truly quintessential Californian gifts! 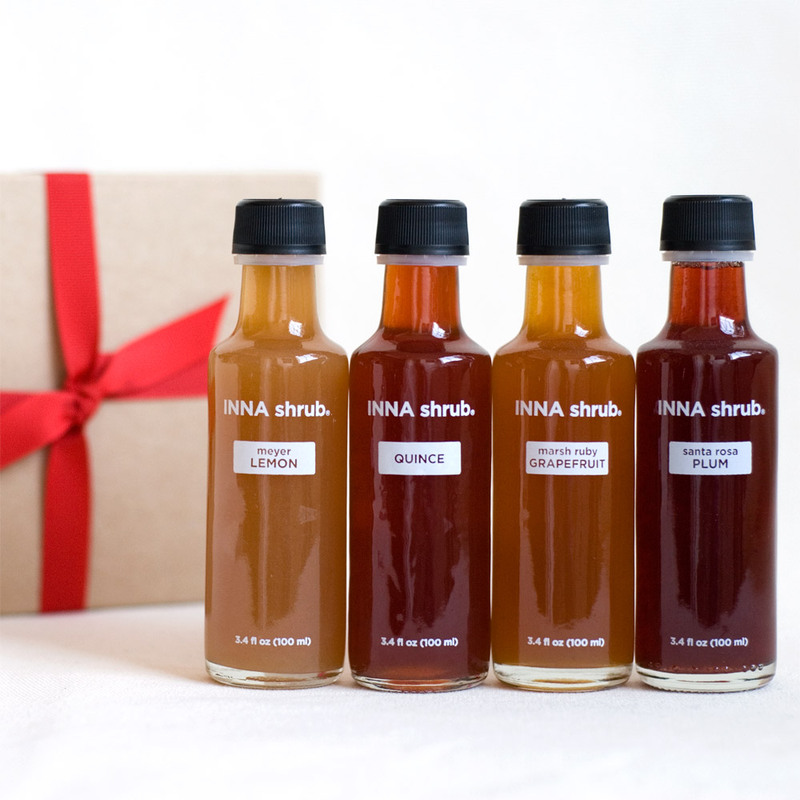 We love INNA and their commitment to sourcing local, but mostly these shrubs are just the most delicious things ever! Our favorite California flavors are: meyer lemon, santa rosa plum, blenheim apricot, and black mission fig. Use them in a sparkling soda, cocktail, or salad dressing! Could we ever sing our praises of Hog Island Oyster Co loud enough? Their oysters incorporate the taste and terroir of Tomales Bay and they’re truly the greatest company. Hog Island offers holiday mail order sending oysters direct from their farm on Tomales Bay to your doorstep for Christmas and New Years. A perfect gift for shellfish fans! Their mail order is a coveted, limited supply and they begin taking orders after Thanksgiving. Place your orders early! We love this olive oil — a beautiful 50/50 blend of California grown Picual and Coratina olives. (And it’s a gold medal winner!) We associate California olive oil with abundant salads, made with a simple dressing of olive oil, lemon juice, and salt. Fun Fact: Miller is Avery’s cousin! These bitters are made with California native plants to create an aromatic bitters, similar to Angostura/Peychaud — and the bottle is just beautiful! We love bitters in cocktails, but they are also great for general digestive health. The Fire Poppy (Papaver californicum) is endemic to California, and blooms in burn areas after a fire. 100% of the proceeds of this sticker are donated to organizations working to aid the Fire Relief. Check out some of their other offerings — lots artwork of California species illustrations, stickers, and small purses. We love this Seasonal Wellness Kit that includes local honey from Big Sur, a lavender soap bar, a candle with eucalyptus, and a breathe easy balm. A gift for self care! Okay, this one might sound quirky but California Abalone is one of the most sustainable forms of aquaculture. And with the fishery closed this summer, we know a lot of our community has been missing abalone. These steaks come pre-tenderized and are so deliciously buttery! We admire the ethos behind this winery and this Zinfandel is extra special — with complex fruit flavors and a deliciously silky texture. The vineyard is surrounded by California chapparal, and we think the coastal scrub influences the aroma. Also check out their wine club! We love the duo behind Fresh Catch and we think their sustainable seafood CSF is one of a kind. And by offering the supplies and recipe for a San Francisco original dish, they make it easy for you! We’re all about low-waste, low maintenance, and low fuss. So we love the idea of these plastic-free shampoo and conditioner bars. The shampoo bars are made with California lemon! And their tagline “Beauty With The Oceans In Mind” gets right to our hearts. This sweetener made from 100% CA-grown dates is amazing: rich, flavorful, and helps us live with less refined sugar. We love it for baked goods, cocktails, and in coffee! A gin that evokes the Northern California coast — with foraged nori, sage, and bay. It’s amazingly smooth and adds a subtle saltiness to cocktails! Okay, disclaimer: the CBD is *technically* grown in Colorado, but we think this product is pretty darn Californian at heart. We give these to our old dog Colt for his achy joints and it helps ease his pain. And lastly, our gift set of products straight from the California coast. Included is seaweed for cooking (broths! ), nori-wakame flakes (ricebowls! popcorn! ), our seaweed snack (sweet, salty, crunchy, and nutrient-rich) and the wonderful Ocean Greens cookbook. Perfect for someone new to seaweed or a long-time lover of sea veggies.